Although considered a contemporary art form in the Northwest Territories (NWT), carvers often depict a strong tie to traditional ways of life. Drawing inspiration from ancient stories, traditional knowledge and personal experiences, Inuvialuit, Inuit, Dene and Métis artists create dynamic carvings using a variety of raw materials from the land. 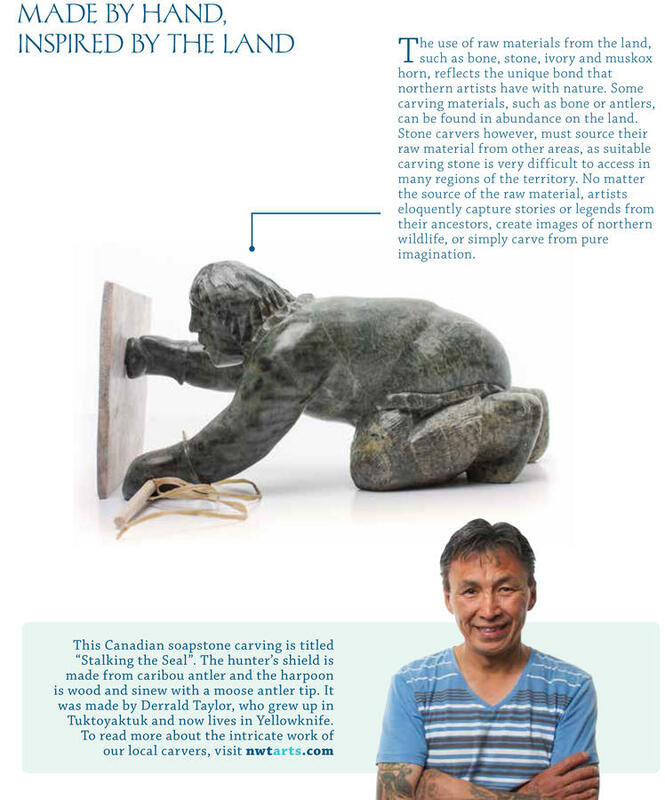 Although carvers can be found across the NWT, the practice is strongest and most recognized in the Beaufort Delta Region, where generations of families continue to carve their past and present in works of art collected and exhibited nationally and internationally. Although there are eight unique Aboriginal groups in the NWT, similar themes appear in art across these cultures. Artists continuously draw inspiration from the world around them. The majestic animal kingdom of the NWT is a common theme – powerful polar bears and sturdy muskox from the Arctic islands; migratory water birds, graceful eagles and birds of prey; and imposing grizzly bears in southern regions are commonly depicted in stone, bone, antler and horn. Mythological creatures and legends, drum dancers, hunters, and women and children are also important figures that permeate the art of our culture. Many carvers have received formal training through art workshops, colleges and southern universities. Others have learned their art in the traditional manner through hands-on experience and working with family members and other artists. Carvings are crafted from many different materials, often influenced by the region and the training the artist has received. Raw materials come from the land – antler, bone, horn and several kinds of indigenous stone – reflecting a unique bond that northern artists have with their environment. Although the NWT is largely covered in rock, there is little rock that is ideal for the art of stone carving. Some alabaster and limestone varieties can be found in the northern regions of the western arctic, close to Ulukhaktok. Artists are largely experimenting with stones from different parts of Canada and the world. The Dene and Métis have long relied on moose and caribou for survival, and are sacred part of their cultural heritage. Northern moose and caribou shed their antlers each autumn, providing carvers with a unique and renewable carving material. Unlike stone, which can take any shape the artist chooses, antler carvers must work with the shape of the existing material. Methods for creating images with caribou or moose antler include carving with a knife or grinding tool, and etching with a hot iron. The broad tips of moose antler can reveal intricate lace-like patterns in the hands of a master carver. The antler can have a highly polished finish or a soft matte finish, depending on the visual effect the artist desires. Bone, like antler, determines what type of carving can be crafted. Caribou bone can be found in its natural habitat throughout the NWT and whalebone can be collected on Arctic beaches. Along the Arctic coast, muskox horn is a renewable material available to carvers. The natural sinuous curve of the horn makes it a popular medium to create beautiful bird sculptures, such as geese with long graceful necks and black beaks. When finely polished, the horn’s black tip and soft yellow and cream hues have a warm translucent glow.